Amazon.com description: Product Description: Early Confucian philosophers (notably Confucius and Mencius) emphasized moral significance of shame in self-cultivation and learning. 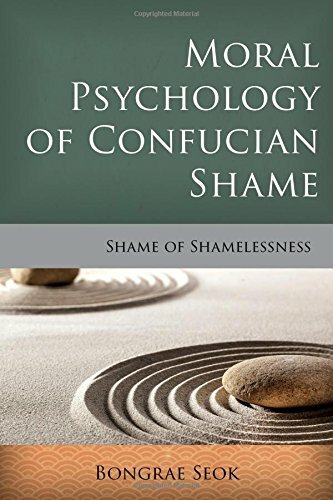 In their discussion, shame is not just a painful sense of moral failure or transgression but also a moral disposition and a form of moral excellence (i.e., virtue) that is essential to Confucian self-cultivation. In Moral Psychology of Confucian Shame, Bongrae Seok argues that shame is a genuine moral emotion and moral disposition. Engaging with recent studies of social psychology, cultural psychology, biology, and anthropology, Seok explains that shame is a uniquely evolved form of moral emotion that is comparable to, but not identical with, guilt. The author goes on to develop an interpretation of Confucian shame that reveals the embodied, interactive, and transformative nature of the Confucian moral self. About: Early Confucian philosophers (notably Confucius and Mencius) emphasized moral significance of shame in self-cultivation and learning.